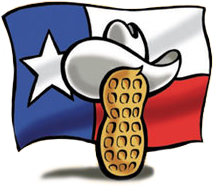 Texas is the second largest peanut-producing state in the nation. Texas farmers produce hundreds of millions of peanuts every year and ship them around our state, the country and the world. The Texas Peanut Producers Board was founded in 1969 and has worked tirelessly since then to support research programs, provide education, develop markets and promote what we believe are the best peanuts in the world. We love working for peanuts. Peanut prices are not available at this time. National Peanut Prices posted by the United States Department of Agriculture. "Feeding Texans one nut at a time." ©2019 Texas Peanut Producers Board. All rights reserved.